I have Olympic fencing on my TV right now and I must admit, seeing two guys in shiny space man suits and face masks just isn't as exciting as watching Flynn or Power dueling with Rathbone. I keep expecting that movie cliche' where every time we see two shiny-spaceman fencers, and the winner whips his opponent, the facemask comes off, the hair flows down, and...it's a girl! Or wait, am I thinking of when they take off their motorcycle helmet? A comment like this makes me want to rip off my shades ! Or like in the movie "Airplane ! (1980)" , I wear a second pair so I can rip them off too ! This is quite a thread - look at the stats. 326 responses from 667 views. That's more or less a 1:2 ratio and you'll be hard pressed to find many more established threads with that kind of response rate. It speaks well of the subject and the OP. Just had to get those words in and it gave me an excuse to bump this one up past the Sunday Spam. What do know? While i was typing the above, the TCM street cleaner came by and got rid of the spam. Kudos to you. Yeh, it would be better if one of the fencers yelled, "You've come to the Olympics once too often!" 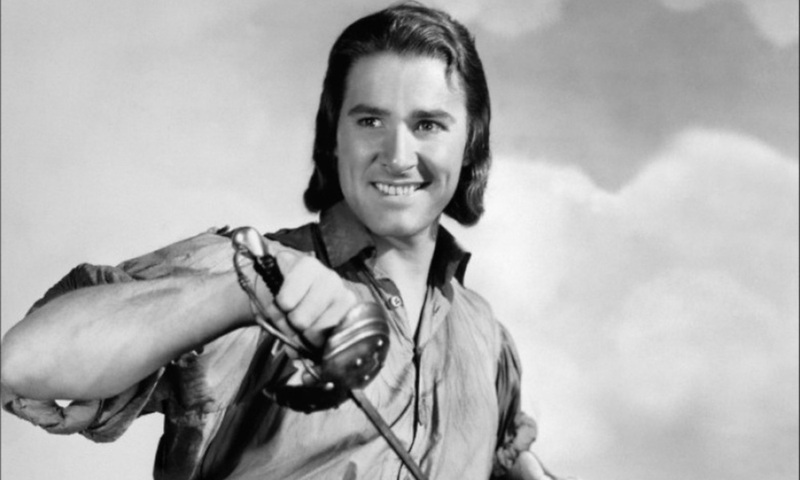 Thanks very much for posting the article, clore, on Errol Flynn, who became my movie idol when I first saw him on TV as a kid (Captain Blood being my favourite of his films, I think, as a young lad) and has remained over the years the actor who, during his prime years as a star, up to, say, 1948, has probably given me more pleasure to watch than any other actor. But let us focus on the actor on screen, for there he had, in his best films, a thorough and unparalleled lightness. Lightness of body—he leapt, swung, danced, fought with swords with the light unconscious grace of a very good athlete, which by all accounts he was. Lightness of tone—even (and especially) in romantic moments, he smiles, he teases, he banters, he jokes gently, surely more than the script and director called for. It’s not physical beauty that makes a great actor, as Spencer Tracy and Humphrey Bogart and any number of stunningly beautiful yet terrible actresses and handsome wooden actors have proved. Neither is it merely the ability to remember lines and utter them with conviction, but rather that quality I mentioned earlier, what seems to me to be the mark of the very finest actors. It has to do with that quicksilver quality of believability, of being the person you are playing, of knowing you are the person you are playing. And, very often, some other mysterious alchemy of ease and wit and humor and dash, some barely subterranean pleasure in the delightful silliness and lovely suspension of reality of the craft. As the years passed and Errol gradually burned himself out with his excesses and vices, he lost that lightness of tone, something that had always been one of his hallmarks as a great screen star. But, viewing him still, all these countless times later, in his best films, he remains an irresistible force of nature on screen for me. Even now, watching him as Gentleman Jim or in The Sea Hawk, say, a part of me still thinks, "Who wouldn't want to be that guy?" Because of his personal life, Flynn will always be a controversial figure. And when you look at the course of that life, burned out at 50, he was obviously a seriously flawed person. But taking a look at the totality of that admittedly enigmatic person, as actor, author (and a good writer, too, though his vices prevented him from becoming even better) and real life adventurer who crammed more physical activities into his globe traveling existence than most of us could ever contemplate, he was truly a unique human being. I'm wracking my brain trying to remember what it was I was watching where some guy posed as a Mexican aristocrat and called himself "Don Diego". I kept joking to my wife, "Where's SGT. GARCIA?" and "Where's BERNARDO?" It was a couple or so weeks ago. It may come back to me eventually, I hope. Sepiatone--Was the movie "The Mark of Zorro" (1940) with Tyrone Power? The original novel depicted Don Diego as a "foppish" dandy, and you can see Douglas Fairbanks and Tyrone Power playing him as full-on fruity...One can imagine Daryl Zanuck being very careful about scenes where Power rhapsodizes about the "perfumes of Spain". That very much bothered Walt's midwest sensibilities when he did the 50's TV show, so he had Guy Williams play Zorro's alter ego as just a lazy home-from-college boy with no sense of social responsibility, who promised to "send a letter to the governor" every time his father raged about the local injustice. Still worked as a plausible disguise, but without putting Williams' manly appeal in jeopardy. Yep, it wouldn't of course be until later and when Guy would then play the lead in that hokey Irwin Allen '60s sci-fi series that he'd be able to stretch his acting abilities and occasionally play his part in that foppish/gay manner. The robot???? Come on everyone could see it was Doctor Smith that caused his heart to flutter. I hope you know that when I typed that "hokey Irwin Allen" thing, I thought of you, ND. I DID think of that James, but then I thought using B-9 for my joke just seemed funnier somehow.